Jackie's former lesbian lover, Noah, has died in an accident. Rather than attending the funeral, she instead convinces Noah's brother, Nick, to steal her ashes. 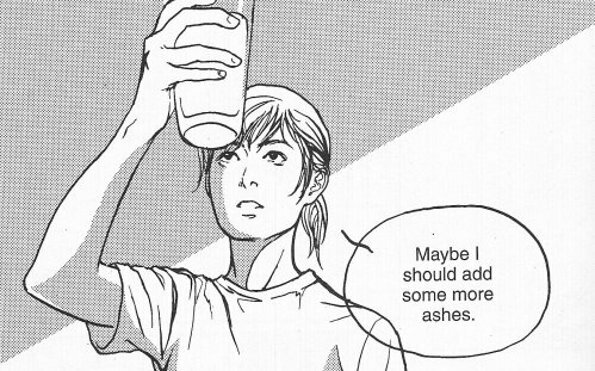 Over the next twelve days, Jackie will mix the ashes into a series of smoothies and drink them, as a means of dealing with and then casting aside her sense of loss. On the off chance that you hadn't noticed from the above description, 12 Days is something of a strange book. Beginning in fairly linear fashion, June Kim's novel starts shifting around in time — subtly at first, through a skilled use of dream sequences, then making greater and more overt leaps back and forth as the narrative progresses. Stepping from Jackie's grief to her life with Noah and back again, the reader isn't left with a story so much as a series of impressions ... which is entirely the point: This book is far more interested in getting to the heart of Jackie's emotional turmoil than in presenting a straightforward narrative, and its hook is thus little more than a plot device meant to draw the reader inside its protagonist's emotional maelstrom. After a while, Kim would reintroduce the bit with the ashes and I'd find myself saying, "Oh yeah, that." Oh yeah, that. Jackie's plot device propels a story that very nearly justifies it, in this panel from 12 Days, ©2006 June Kim and Tokyopop Inc. It's tempting to compare 12 Days to the other big, ambitious lesbian graphic novel of 2006, Alison Bechdel's Fun Home. Like Fun Home, June Kim's book is a meditation on loss, using formalist slight-of-hand to shuffle the deck and keep the reader's eyes focused upon what the artist wants to be seen and learned, bypassing traditional storytelling structure to achieve its aims. The similarities end there, however. First of all, 12 Days simply isn't as daring or complex a work as is Bechdel's grand Rubik's Cube of a novel. Don't get me wrong: This isn't so much a criticism as a line of demarcation. Kim's book is a relatively restrained story, focusing on a love affair and its aftermath, while Fun Home attempts to chart the evolution of a family straining at the seams, asking serious questions about identity and circumstance along the way. That doesn't make the comparison any less interesting, of course. Both books use similar strategies for different aims, from 12 Days' controlled focus on emotional significance to Fun Home's onion-like peeling and repeeling of its story to examine a singular tale from as many angles as possible. Between these two books, you could write one hell of an essay on the range of possibility underlying non-linear storytelling techniques. I largely enjoyed 12 Days. It contains a great deal of humor and emotional resonance, and June Kim's attention to detail is as skillful as her attention to character and pacing. There are multiple blink-and-you-miss-it moments that flesh out the book's personalities, using inference to pass along details that could only otherwise be introduced through expository dialogue — the way the reader discovers that Jackie is allergic to chocolate, for example, which in turn reflects back to a gift given to her by Nick, her reaction to which adds a bit of nuance to the scene in hindsight. 12 Days is full of clever moments like this, and almost succeeds as a rich and satisfying novel. Unfortunately, a couple of things hamper it along the way. 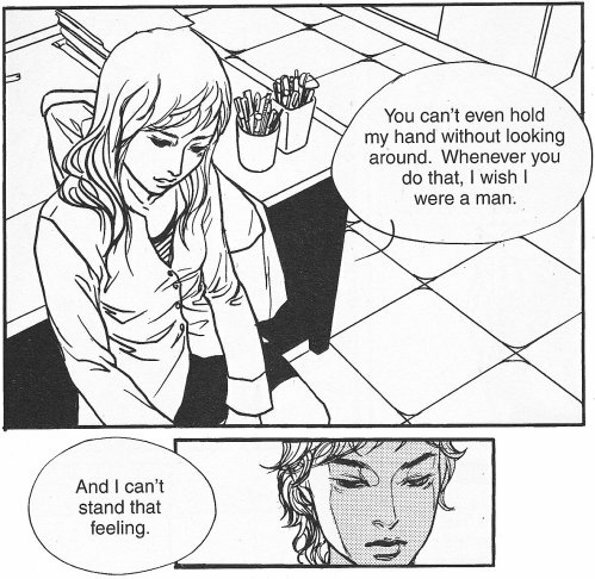 Jackie confronts Noah in this sequence from 12 Days, ©2006 June Kim and Tokyopop Inc.
To be honest, I have to admit that I set down 12 Days wondering if its publication by Tokyopop might have complicated its creation unnecessarily. Kim's book is drawn in a style of comparative Western realism, and one could easily imagine the brief (and sometimes jarring) use of chibi-isms to have been grafted on after-the-fact, in order to justify Kim's sale of the book to a manga-oriented publisher. They seem unnecessary. This could, however, merely be the frustration of a critic still making the cognitive leap from one set of graphic schemata to the other. It's entirely possible that younger readers and those more fully immersed in both comics cultures, and thus less likely to see the distance between manga and Western comics, could well look at the book and not have the slightest idea of what I'm talking about. Maybe it's just me. Less easily rationalized is a final section that seemingly upends the book's entire premise, for no good purpose so far as I can tell, and its inclusion is the principal reason that I can't wholeheartedly endorse 12 Days. It's confusing enough that I still can't exactly suss out exactly what the author meant that scene to accomplish. After spending the previous 196 pages carefully leading the reader through the chaotic pathways of a relationship neither fully ended nor easily forgotten by either party, "Chapter 0" almost feels like Kim opened up the last page and scribbled "Ha! Just kidding!" in the margins. Almost. It's vagueness partly deflects easy interpretation, although I sort of feel like I'm giving it the benefit of the doubt simply because I want to think the better of the book. A more judicious editor might have given 12 Days the extra clarity it needed to put it over the top, either by pulling "Chapter 0" entirely or at least called upon its author to strengthen its purpose as an ending scene. As things stand, Kim's debut book for Tokyopop is an ambitious and partly satisfying work that very nearly succeeds, but doesn't quite do so. Given the obvious talent on display here, however, there's no reason to assume that June Kim's next book will contains such flaws. I look forward to seeing more.